Items are the goods or services that you deal with in your business. What is the purpose of adding items in Zoho Books? 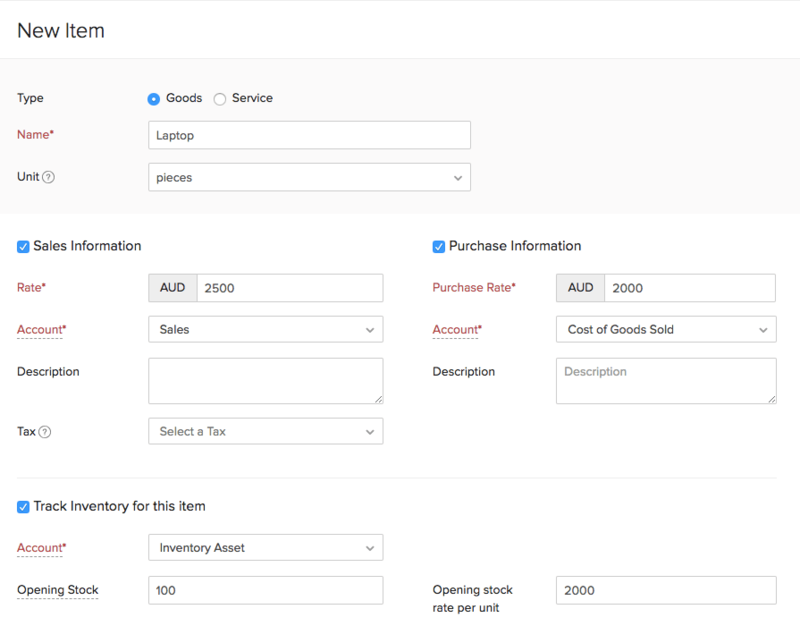 Whenever you create transactions (for example, an invoice for your customer), you can select these items that you’ve created and their details will be auto-populated. You can either directly create an item from the Items module or import them from other systems. Go to the Items module in the left sidebar and select Items. Click + New in the right side of the page. Rate Rate at which you sell the item to your customers. This rate will be reflected on your sales transactions like invoices, sales orders, etc. Account Account used to track sales of the item. Description Add notes related to sales of the item. Rate Rate at which you buy the item from your vendors. This rate will be reflected on your purchase transactions like bills, purchase orders, etc. Account The Cost of Goods Sold account is used for tracking the purchase made for items in Zoho Books. Description Add notes related to purchases of the item. Select the box Track Inventory for this item. Account Account which tracks the inventory of the item. By default, it is Inventory Asset. Opening Stock Quantity of the item which you have in hand on the opening balance date. Opening Stock rate per unit Cost at which you purchased the item for the opening stock. Fields in red are mandatory, others are optional. 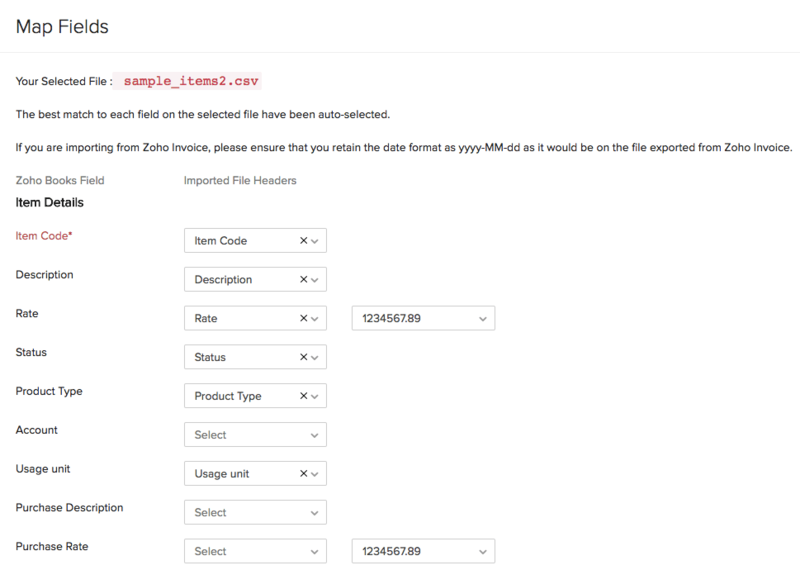 In Zoho Books, you can enter an opening stock for your items. Whenever you make sales or purchase transactions for items in Zoho Books, this stock gets auto-calculated accordingly. For example, let’s say you enter the opening stock for item A as 100. Then, you make an invoice for a customer by selling 70 units of Item A . Now, the stock will get reduced to 30 (100-70). You now decide to purchase 100 units of item A from your vendor and create a bill for the same. Now the stock will be increased to 130 (100+30). This is how inventory tracking works in Zoho Books. Go to the Items module and select Items. Click the Hamburger icon on top of the page and select Import Items. Click Choose File and upload a file from your system. 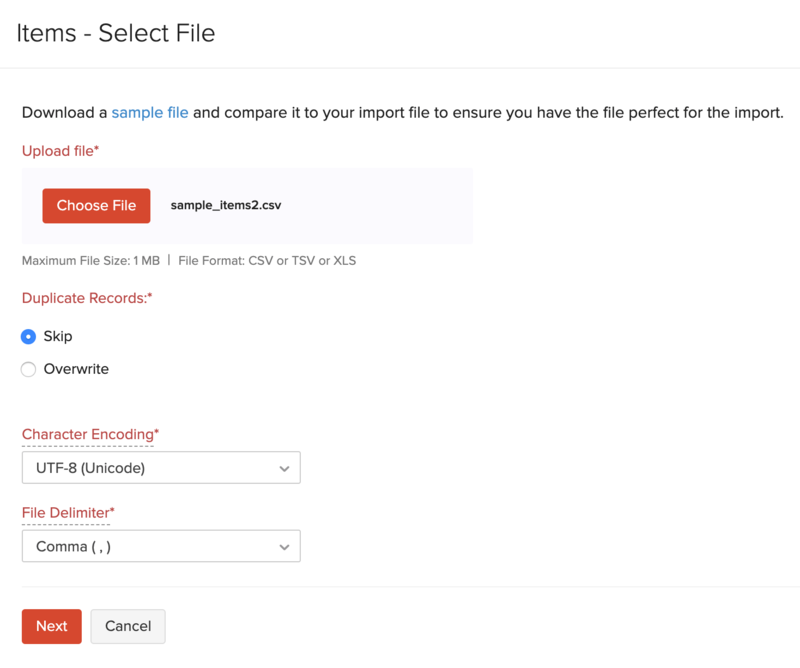 You can download a sample file from the same page to verify the format for the import. 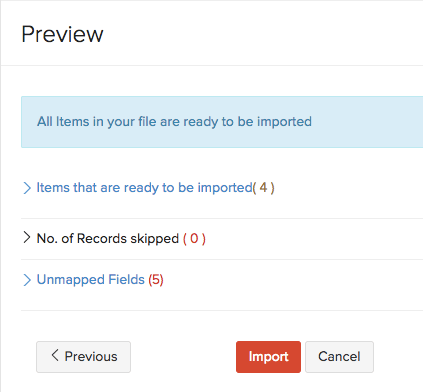 Ensure that the fields are mapped correctly in the Map Fields page. Sometimes, you might get an error while importing due to a mismatch. In such a case, verify the mapping of the fields.